The 4th annual Jouk Li Jou Kan Foto – 2014 Youth Photo Camp in Haiti begins July 25! Here’s our Wish List! The phrase fast and furious is appropriate for the task upon us preparing for our fourth annual Jouk Li Jou Kan Foto. We’ve got the volunteer team and the plans, and now we need to get the funds and materials together to make this another successful summer learning program for our 32 students. We’re really excited about the extra additions to our curriculum this year integrating the basic steps for learning about and starting a small business, resume writing, one on one computer training, continuing photo studio instruction, and more local professional guest speakers. Students will still have daily assignments including the perfect photo for a postcard. All of our students, Guy and Jen, and the entire Jouk Li Jou Kan Foto Team appreciate the love and support over the years. Thank you for believing in us! Click here to donate directly to our 2014 Jouk Li Jou Kan Foto campaign. Please take a look at our 2014 Wish List. It will be updated daily as we receive items. – TAX DEDUCTIBLE DONATIONS NEEDED: raised over 102%!! 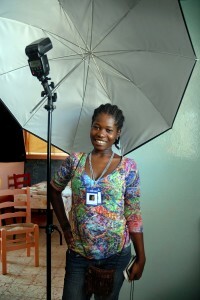 We need to raise $8,500.00 to pay for our 4th annual 10-day Youth Photo Camp in Jacmel, Haiti. Your dollars will help pay for airline luggage fees, lodging and food for our Haitian staff and visiting students, press badges for photo sutdents and volunteers, transportation and gas for the entire team, t-shirts, technical equipment and computer maintenance, donations for the outdoor slideshow presentation, local printing for business class workbooks, and all supplies listed below. – Thank you Charity4Life for sponsoring all 4 students from Cité Soleil!! – At least 8 good working Laptops – we have 10!! – 35 Thumb Drives with lanyards – we have the thumb drives! – Sponsorship of four Cité Soleil advanced students – $300 covers food, lodging, and transportation for each – Adeline, Djimmy, Witslin, and Nederge are sponsored thanks to Charity4Life! – 10 Working Digital Point and Shoot Cameras and any DLSR cameras (we have 2 Canon lenses and need bodies) – we have 7 Point and Shoots so far, 1 Nikon and 1 Canon DLSR (!) – we have what we need for this trip BUT we always need cameras! – Compact printer capable of printing letter size paper for the resumé class. – we’ll be fixing the printer at ACFFC. – 35 Compact Reporting Notebooks and Pens for students – we have the notebooks and pens! – Additional items for kids and artists: tubes of oil and acrylic paint, paint brushes, beach balls, soccer balls, dominos, balloons, colored chalk, sunprinting kits – we have 31 beach balls! ← Previous PostOur Biggest Ti Maché of the Year! Next Post →Thank you from the Jouk Li Jou Kan Foto 2014 Team!! !